The new IMDb Action Bug covers pictures on every page on Firefox 47. The logo bug is active and is nice, if it didn't block existing information. If clicked on, it directs to the home IMDb page. It is located too low in Firefox 47, not in the correct location next to the search entry field as it is on Chrome. Also, WHY THE HELL DO I HAVE TO "SIGN IN" AGAIN TO POST? I changed my emoticon due to that idiocy! I've forwarded this information to our technical team for further investigation. We'll reply to this thread once we receive further information. We suspect this is a problem with ad blocking software. If you are running an ad blocker, please switch it off and let us know if this fixes the problem. there is a reason i use an ad blocker. Translation: You will look at our god-awful, annoying, ugly ads or we will not let you use our site, so quit complaining. Complicated issue. But to me, look, if I had a way to eliminate television commercials I would do it. So would a lot of people. The difference is that there are only so many channels but tons and tons of websites that offer free content. Very few sites offer anything that you can't get somewhere else. Once the page has fully loaded you get the cast members of The Defenders appearing above the search panel, and therefore you can't click on it. This is on Windows 10 using Google Chrome. You are correct. I am using the AdBlock Plus extension for Chrome. When I whitelisted imdb.com it now pushes the main site content down below the mugshots of the Defenders. Removing AdBlock Plus did fix the problem. However, static ads that do not require moving ad blocking software would be preferred on IMDb. Thanks. Yes, I disabled AdBlock Plus (ABP) for the whole IMDb.com site, not just on the page affected, and now it has pushed the page down below the Choose Your Defender ad which was causing the problem. This reply was created from a merged topic originally titled Links in the Black Area Not Working. I've encountered a problem. Once the film you've searched for is loaded, if you click anywhere in the black area the links don't work except for the Adventure, Drama and the release date links. Upon moving the cursor to say the News and Community link a thumbnail appears with a face and some text, moving it to the Watch List link brings up a different thumbnail, the same thing happens when you're looking at an actors biography, see the three pix below. Furthermore, you cannot get into the search box either. I've tried this with three browsers all of which give the same result. I've never had any trouble using IMDB while running an ad blocker until today. The last time I used it was last night where I needed to find something about The Waltons and in doing so the site worked normally with the ad blocker enabled. I've checked my three browsers, Opera, Firefox and Chrome all with the ad blocker enabled where I get the same result as in my first message, with it disabled IMDB works fine. This is the bit I don't understand, why should this issue crop up now when I've never had any bother with IMDB using an ad blocker in the past. From now, every time I need to use IMDB I've got to disable my ad blocker and enable it when I leave the site. 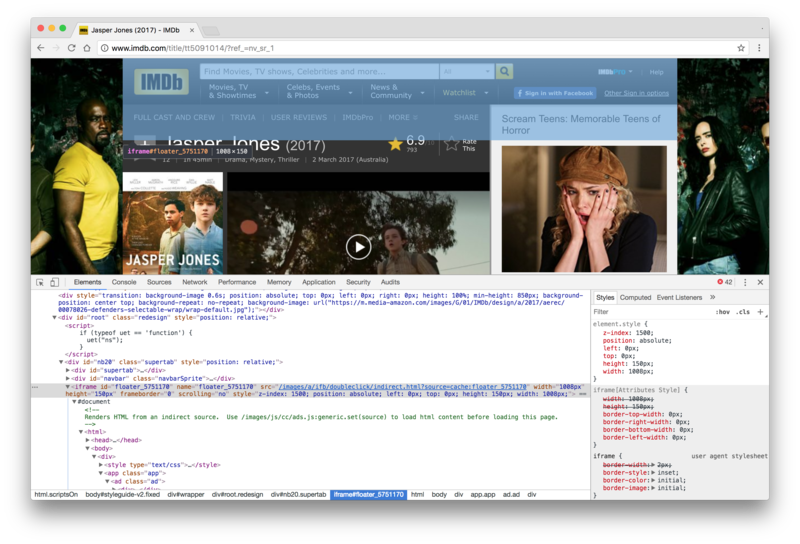 Or install a browser without an ad blocker dedicated to IMDB. As a matter of interest is IMDB Pro free of advertising? > As a matter of interest is IMDB Pro free of advertising? This reply was created from a merged topic originally titled reference view: pop-ups preventing searching. Thanks, this is useful (and welcome back here too; noticed you earlier in the week). Can you open an incognito window / private browsing session with the ad blocking disabled and try again? You'll need to login to be bounced to reference view too. If it is still failing, please let us know what operating system / browser (and version) you are using. Also, which ad blocking system were you using before you switched it off for this test? This reply was created from a merged topic originally titled IMDB banner is blocking actors faces. This reply was created from a merged topic originally titled Logan Lucky Ad Template Interferes with Links. The Logan Lucky ad templates interferes with links on the advances search page (http://www.imdb.com/search/) main window. The following links function until the template loads on the page. After the template loads, the links do not work. None of the text can be selected. It's quite possible that this ad template is affecting other IMDb pages and may be the root cause for problems reported outside the US during the last week. See replies above -- do you have an ad blocker installed? I do not believe in using ad blocker software. I do not have any installed. Thanks (and sorry for jumping to the wrong conclusion; I, obviously, agree with your position on ad blockers). 1. Can you confirm the same behaviour if you open an incognito / private browsing window? This will ensure nothing is badly cached. A quick update, in your case (which is different than everyone else on the thread) we have moved the offending ad from the search and other related pages until this can be fixed properly. The customized IMDb logo for Logan Lucky is no longer present. It appeared to interfere with the the links on Advanced Search page (http://www.imdb.com/search/) main window. This reply was created from a merged topic originally titled IMDb ads. Overlay is very distracting and needs retired as a matter of urgency. The page also seems to be constantly downloading now, so could eat up a limited data allowance. Note: This conversation was created from a reply on: advertising overlay is back - unfortunately. I also had the same problem. In addition to being distracting, the pneumatic tube animated graphic prevented me from clicking on the + SIGN in order to add a movie to my Watchlist. I disabled AdBlock Plus, and the problem was solved. That said, it would be appreciated if IMDb removed the graphic altogether. Static ads that don't require removing an ad blocker would be preferred. Thanks to Col Needham for providing a suggested fix — which, hopefully, will only be required temporarily. Not blocking ads and liking ads is a lifestyle choice. Those that choose to not have an ad-blocker have every right to that choice, just as I have every right to keep mine enabled, whatever site I am on. The phrase "disable your ad-blocker" makes me feel sick to the pit of my stomach, but I appreciate not everyone feels that way. Ah well, guess I am going to have to live with this issue if there are no other solutions. Thanks for your comment, and everybody else who contributed. Hello I am unable to type anything into the search bar. No problems entering text on any other sites When cursor is on IMDB search window I get picture pop ups of Iron Fist stars. Are you using an Ad Blocker? If so, disable it for the IMDb site and refresh the page. This reply was created from a merged topic originally titled can't select title using chrome browser..
can't select title using chrome browser on win7 computer. Got the same. It's in Chrome and Firefox. I'm unable to search for anything. Can't even click the help button. Note: This conversation was created from a reply on: Can't click search bar because of some ad. This reply was created from a merged topic originally titled Can't click search bar because of some ad. This reply was created from a merged topic originally titled iframe floater annoying. This reply was created from a merged topic originally titled Overlay of the defenders advertisement. This reply was created from a merged topic originally titled can't add a movie to watchlist because of new ad animation. Because of the new ad animation, I cannot check a movie to add to watchlist or any other of my lists. On PC, Windows 10. It is a IMDB site issue. It's annoying as hell. Like the OP, I can't add anything to my watchlist due to the imdb logo placement. Who designs this crap? Less focus on interactive stars when you mouse over them and more focus on not obstructing your own page layout. The original static imdb logo itself was fine, replacing it with this animation that is in the wrong spot on FF is completely pointless. Note: This conversation was created from a reply on: Watchlist issue due to animation of IMDB logo..
No ad blocker. Ironically, I had to start using an adblocker on imdb and add a script to be able to navigate the site normally. People don't mind non intrusive ads, but end up using adblockers because of the intrusive and hijacking nature of them. Sometimes we just want to be able to browse a site, but page slowdowns, hover pop ups and view blockers etc which have become the norm now, make that impossible . Note: This conversation was created from a reply on: IMDb ads. Its not just windows. I have a Chrome laptop and have the same issue. I read a reply earlier further down about the issue the sites only recommendation is turn off ad block. It does solve that stupid new animated ad issue by pulling it up above the ad. Doesn't make it less of an annoying problem since we don't want to turn off ad block. Everything was fine till they decided to throw that thing in. Note: This conversation was created from a reply on: can't add a movie to watchlist because of new ad animation. This is why people use Ad-Blocker! Which is something I highly recommend. Although in this case it didn't block it. But this ad was so ingrained into the HTML of the site that it was blocking it's own functionality. Annoying. It is the ad blocker which is causing the problem. Please switch it off and let us know if this fixes the problem. Having the same issues, please fix. This reply was created from a merged topic originally titled Glitch?. What was the "Logan Lucky" glitch on imdb? For a short while, everytime I opened a new tab and went to imdb, the two sides that are usually grey (with the content in the middle) were filled with a banner (a picture sort of) of the film "Logan Lucky", and a short animation of the imdb logo disappearing in a tube. I went to check my phone, and after a little while, my whole computer glitched and the screen went superweird. When I moved the pointer to the stars on the banner, they fell down and warped back so I could do it again.. At first it was fun, but when I realized my whole computer was fucked up because of it, I restarted it, afraid of being hijacked or whatever. When I went back to imdb, it was gone. There are no signs of it ever being there in the first place. What the heck?? Anyone else experienced this? This reply was created from a merged topic originally titled Can't click on search bar. An ad keeps displaying.. Unable to click on search bar. An ad keeps displaying. it helps, i wouldnt say it is fixed. This reply was created from a merged topic originally titled Col Needham (moderator) removed my post. Col Needham (moderator) removed my post regarding an ad animation blocking me from adding a movie to watchlist. Would a moderator please tell me why my comment was removed. I just signed up for 'Get Satisfaction'. So far it seems to cause the opposite reaction. Your original post is in this thread above.